We're starting a new challenge at Ike's World today and, as usual, we have an Anything Goes theme. However, our optional theme this fortnight is "Easter or Spring Flowers." The one time I got to visit friends in the Netherlands, all the tulips were in bloom and I have never forgotten the sight of windmills and tulips so Ike's glorious image of "Windmill" was the one I definitely had to use. I used my polychromos pencils to color the image, then die cut it and the dp/CS frames with stitched dies from Die-namics and pinpoint dies from Memory Box. The dp I chose were all scrap pieces, as were two of the ribbons I used. The ribbon for the bow doesn't count as a scrap since I make up those bows by the dozens, toss them into my stash and then pull them out as needed. The bow was white but I "dyed" it with a ProMarker. I used as many different geometric patterns as I could find in both the papers and the ribbons for some visual texture, keeping everything within the same color family so that it wouldn't be too "busy." Gorgeous card and amazing coloring. Love your bow too. Great idea to make up a bunch ahead of time and use as needed. 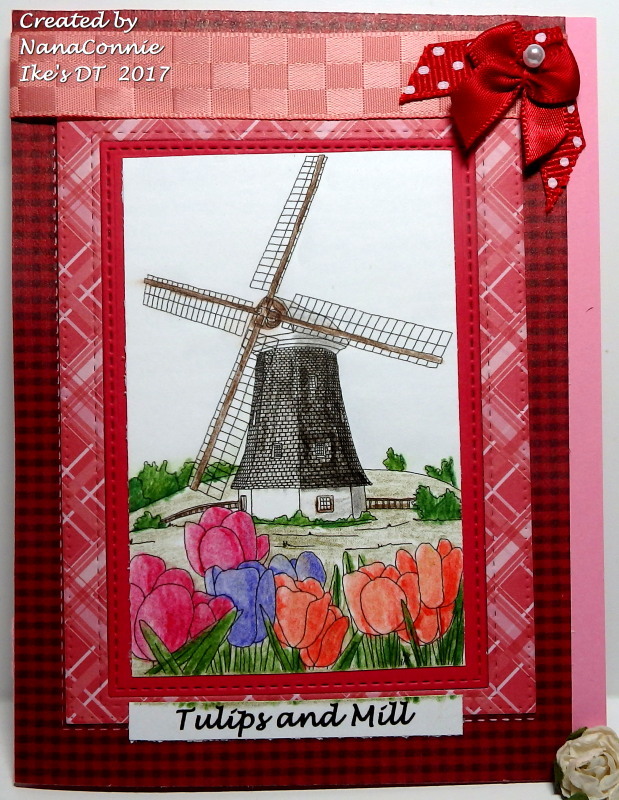 This is gorgeous Connie, I love the windmill in the background and the tulips are beautiful. Thank you for joining us at Colour Crazy Challenge. Oh Connie this is just fabulous! LOVE the image and your coloring/design are perfect! Thanks so much for joining in the fun at our Double D ‘Neon / Brights’ challenge! We hope you’ll come back often. Beautiful design and images! Love your windmill, we have several around here and I find them majestic! Beautiful filed of tulips. Love your creation! Thanks so much for playing along with us at The Double D Challenge Blog, Donna, DT Member. Stunning card. Thanks for joining us at Quick Quotes. So lovely, that is a great image! 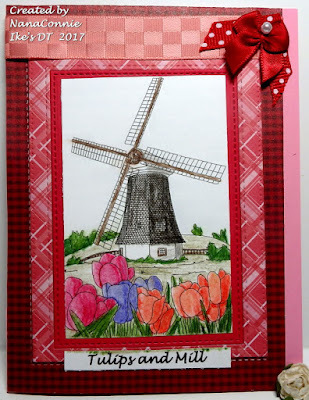 I love your windmill and assortment of tulips! Someday I'd love to go to the Netherlands to see them in person! Thanks for joining us at SugarPea Designs! Beautiful Connie. I love the European image with the Tulips. Love it. So happy you joined us this month at SugarPea Designs. so pretty! Thanks for joining us at Quick Quotes! Tulips are my favorite flower and this card is so well done! Thanks for joining us at Quick Quotes!